and make North America’s characteristic landscape. The realm of high mountain peaks has so often felt like the prime place to experience the meeting of earth and sky—all those jagged summits piercing the atmosphere, their sheer power (primal earth) stirring sky to respond, calling forth great explosions of cloud and bringing down the rains from on high. Yet: today I see the folly—and dare I say the maleness—of that narrow view of the eternal dance of sky across earth under sky. For now, all around/under/within me, a very different and equally powerful union is taking place: the skin of the earth is rippling at the wind’s touch. Here, at the bottom of the sky, rolling hills blanketed with supple grasses shimmer under a day-long caress of the hundred-mile winds of the plains. On a nearby slope, nearly backlit by the mid-day sun, large-scale patterns show the wind moving steadily left to right. Yet within this flowing motion are countless smaller and constantly shifting shimmerings, bright patches within the larger patterns, slipping and sliding across the hills: expanding disappearing returning trembling. This play of light is dynamic and detailed, riveting and subtle to the very edges of perception in ways that call to mind the ionic exuberance of the northern lights. Drawing my gaze in, to the prairie carpet closer at hand (foot), I’m surrounded by dense clumps of grass in constant motion—each with countless slender stalks in full seed—leaning with the wind, then rebounding back only to be caught up in the current and bent downwind again. Amidst this endless pulse, glimpses of the magic taking place at the smallest scale: within the swaying of every individual blade as its angle to the sun changes, so too its color shifts from moment to moment, almost faster than can be registered by the eye and mind, pale chocolate brown, to tan, with flashes of bright sun-glowing near-white, at times in synch with its neighbors, yet more often in a shimmering complexity of colors pulsing in each small patch of ground. It’s this vivid and ceaseless play of light within a near-infinite sea of similarly subtle and dynamic dancers that forms those earthly aurora that fill my eyes when I lift them again to take in the whole hillside a couple hundred yards away. Of course, we’ve all seen and reveled in the ripples of wind across farm fields and wild meadows and forest canopies. . . but this tallgrass prairie seems the ultimate expression of the subtle, ceaseless touch of wind on the earthly skin of plant life. The grasses here are just so dense, yet also so supple, that the smallest details of wind—its puffs and breaths and their ever-shifting edges—are continually revealed. This numberless community of plant-bodies, so flexible, so resilient, responds to the sky’s touch with profound sensitivity, even sensuality: a diverse and subtle sigh of landscape-scale light and motion. In contrast to the bursting forth of clouds and rain around sky-piercing mountain peaks, here we encounter earth responding gently yet powerfully to the sky’s passing touch. This active/receptive, male/female complementarity may be a bit facile—warm, sunny days amid alpine meadows or bitter winter winds on the prairie would turn it inside out—but today at least, these rippling slopes seem to express a keen receptivity and reciprocity. This day of earthly delight is taking place on the far edge of the “next biome over” from my home in the foothills at the southern tip of the Rockies—a crossroads where three great North American landscapes come together, from which each spreads far over the horizon. From the arid, grassy hills behind my house, the great mountainous spine of the Rockies pierces the continental plate north all the way to the Yukon; while deserts spread to the south and west, ever drier with distance out to the Mojave and Sonoran/Chiricahuan border zones; and the Great Plains to the east extend almost to my doorstep, a couple miles downstream in the Galisteo Basin. While I’ve explored much of the mountainous north and a fair bit of the deserts to the south and west, this eastern realm has been much neglected. But now it’s time. Time to feel, to be, to walk and sit, my fleshy bit of creation entering into this expansive landscape, pebbly soil beneath boney feet, arm hairs and wide eyes brushed by the same winds that ripple the grasses, sun warming skin as it does the stony outcrops alongside this stream. These hours in the tallgrass realm will live on in the cells, the neural-mirrors, the ever-expanding bodily experience through which my soul comes to know and live within the soul of this continent. After today, the near edge of the plains near my home will be alive to me in a bigger way. The story of the prairie is much-told: once stretching from Manitoba to Texas, from the Rockies to the eastern forests, tallgrass in the moister east, shortgrass in the drier zones alongside the Rockies, and mixed-grass between. Then came the plow, and the cattle, and the desire to “make something” of this “empty” land. Today, bits of untilled prairie remain scattered across the plains; most are tiny (20-200 acres), some larger ones encompass a drainage and a few hills, and a handful are expansive enough to retain at least a hint of a landscape-scale feeling. 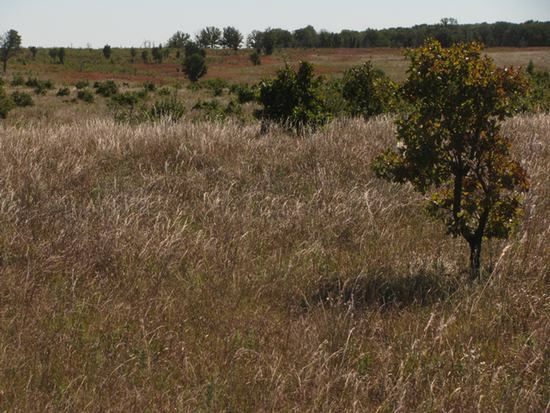 This Nature Conservancy site in northeastern Oklahoma is, at 60 square miles, the largest such remnant of unplowed tallgrass prairie; the federally-managed Tallgrass Prairie National Preserve a hundred or so miles north in Kansas is nearly as big. We can thank the rocky, plow-gnawing Flint Hills for both. I spent something over nine hours exploring the preserve—taking four hours to cover three miles of trail and five hours on forty or fifty miles of road. There wasn’t much wildlife along the trail loop, on and around one of the highest, steepest open areas and some of the narrowest forested drainages; this was the place for immersion in the skin of the land itself, the soft grasses on the hills and the craggy woods in the hollows (where I also lingered long, reveling in rocky stream outcrops and bright autumn reds and yellows so reminiscent of the New England woods where I first came to know my place in the natural world). But wildlife abounds in the miles of rolling hills along the roads: bison, in groups of a dozen or two on the roadside to a hundred or two stretching across nearby slopes (once filling a full quarter of the 360-degree panorama); birds bursting forth from bunches of grass beside the road; hawks everywhere, cruising low over the rolling ground, actively hunting those birds and the countless ground-dwelling creatures thriving in this rich landscape; here and there, a deer. Throughout, an occasional butterfly, a few late flowers—small yellows and purples, here and there a patch of thin goldenrod-family cousins. It all feels so wild, so primal. Yet these hills have been lived on and managed—ranched, bison introduced, burned regularly—for decades, while remaining whole in a way that forests rarely are after being so fully “used.” The rancher kept a light touch, never overgrazing (and cared enough to sell to TNC); recent management mimics the natural patterns of fire and grazing. 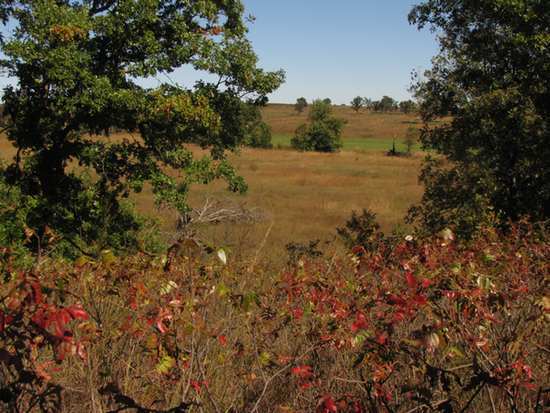 The heart of this land was never quelched, so today there remains a classic mix of the four or five species of grass that define the tallgrass prairie. Most of the grasslands are knee-to-waist high; some robust little bluestem, switchgrass, and indiangrass reach to my chest. 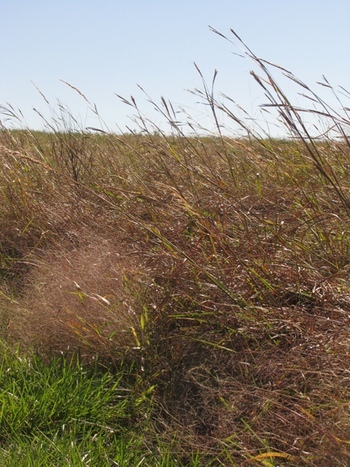 Big bluestem is scattered throughout as well, its slender stalks reaching shoulder-to-head high and sometimes more, kings of the landscape—in one area that hadn’t been burned for fifteen years, these six- to nine-foot giants had spread, settled in, and become clearly dominant. Back on the trail, now looking a mile or so across the valley that was once home to the ranch headquarters, a long grassy hillside ripples in the wind. It’s maybe a mile long, with another half mile or so of mostly-open slopes upwind, too far away and too far to the side of the sun to explode with the subtle, detailed aurora-on-earth plays of light that I saw earlier. But instead, a larger-scale motion recalls the steady, turbulent bottom of a river tumbling over its streambed—again, this earthly skin responding to the touch of the bottom of the sky. . . . Then the shapes and steady patterns of wind in grass resolve anew, and conjure a herd of bison, of ancient horses, of mastodons, an endless wave of creatures thundering across the prairie—an incessant, undulating rhythm across the hillside, today but a ghost of the numberless host that once co-created these rolling lands. These strong winds and abundant grasses were once cousins to the great herds, animal and plant communities together forming the vast, open heart of North America. As this reverie fades, I linger near the top of the grassy hill. . . . I just can’t get enough! Then, two moments in quick succession complete my transition from the expansive, landscape-scale awareness I’ve been cultivating for the past couple of hours, and settle me back into the flesh and bones of this solitary, sensitive body. First, my hand brushes a trailside seed head; I flip the fingers around, checking for ticks, a modern scourge of outdoor enthusiasts. Three diseases-harboring species live here; yet is it just a fearful over-reaction that bundles us in DEET-soaked layers? All day I’ve been avoiding touching these beautiful fully-seeded-out beings that surround me! From here on out, I stroke them on the way by, let them slide gently across my palm and through my fingers, or cradle their puffy fullness in my hand—reveling in the skin-on-seed tenderness of the meeting. Then I feel the wind on my back and notice my backpack is blocking it. So I turn to face the breeze—and suddenly realize that for nearly the entire walk I’ve either had my back to the wind or my head ducked low against it to keep my sun-and-tick-shielding hat brim from blowing back. Now, finally, I take off the hat and let the wind sweep my hair as it does the grass. Warm sun, warm breeze. . . the wind has calmed a bit, now maybe 15mph, gusts to 20 or 25. As ever, it wraps itself around me, massaging my windward side while sliding around my body, ever subtly varying, its ebb and flow sometimes nearly abating, then rising to nudge my head to the side, or pushing hard enough that I take a half-step back. And so I find myself basking, at last, in that same glorious whole-body sky-caress that these hills receive every day. Sun soaking into skin, my torso tossed gently in the splashing currents of wind rushing by; each fleeting moment fresh, new, yet also, as one rolls into the next, becoming a connective tissue of a sort within the enduring shared experience of being prairie, today. This animal body, a mobile bit of planetary skin, is also ever shimmering, wandering amid the wonder here in the life-filled edge at the bottom of the sky. Posted on 2014/12/16, in Earth, Jimwords and tagged tallgrass prairie, Walt Whitman. Bookmark the permalink. 1 Comment. Lovely, evocative piece, Jim. Really makes me yearn to record springtime in the prairie! Also reminds me of the (mountain-encircled) prairies I’ve known – Palouse prairie in Montana, Madrean Prairie in Arizona. Tremendous vibrant ecosystems only a few feet tall. And it reminds me of the first time I drove across Nebraska on my way to North Dakota. It was just after a heavy rainstorm and the clouds drifted heavily over the rolling hills. It puzzled me to no end trying to figure out what held the clouds up, with no mountains for them to cling to.